It is a challenge to find the right place to post to give/receive support. I know inactive boards are not especially supportive. Let me know how you want to continue your success and I might be able to come up with some specific directions for you. It is great that you are thinking about this before you end your fast. I know you will have continued success! First, let me thank you for all the tips and compliments. I was asking around other communities about IF because that's what worked for me before the fast. I am planning on going back to it once the fast is over, but I wanted to talk to someone who has been doing it somewhat long term. Have you been doing it for over a year? Or for that matter know someone who has been doing it for over a year? 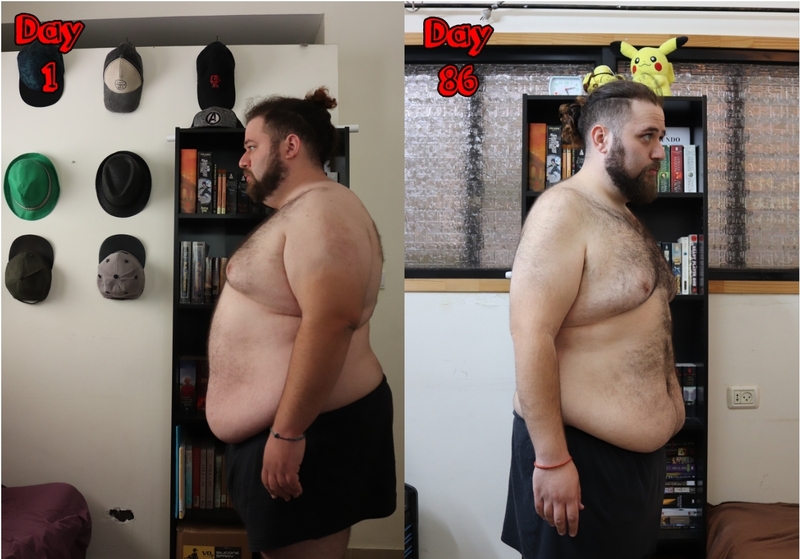 Hey Guys, I am new Here and I just wanted to upload a progress pic :) day 86 going strong I have been asking around, how do you guys stay accountable after finishing the Juice cleanse?I really struggled in the past when it came to keeping the weight off and I am looking for ways that worked for other people. Wow, that is awesome Peter! I have not figured out how to stay accountable. I did a 90 day reboot, then turned around into a massive yo-yo. I was thinking of something like a drop dead weight. Whenever I creep up to that drop dead weight, it's an instant reboot starting the next day. And weighing every day so you can't ignore the creep? I'd love to hear some other approaches that have worked for people. inspiring! maintaining is rough. i'm not good at it. i hope u will keep posting so you can let me know how/what you do. I am aiming at the building of as many healthy habits before and while I am on the fast, and I aim to maintain them after the fast as well, but I am also actively looking around as much as I can for what worked for other people. Hi, All. Sure hope this group is active. I just started the diabetic 2-month reboot. And it's taking awhile for folks to post. Hi Lilly! Our group is pretty slow right now, too. Maybe it's the holidays. I bet the first week in January this website will go crazy! ;) How's it going on your reboot? Lilly, join the groups here and stay with it. We're here long term. Good luck with your 60 day reboot guided version. If you want to stay at it more than 60 days, I mean, you need to make friends who are also going at it longer. I think. hi. i like your yes to no idea. good luck this weekend! Day 13. Had a very close call with some comfort food but just kept my head down and focused on how I would feel the next morning. Did I want to weigh less tomorrow or more tomorrow? How happy would I be in the morning looking back to see that I didn't give in? So I just dug my heels in and got cranky, and the next morning I was indeed so happy I hadn't caved. Put that feeling in my pocket for the next time I need to pull it out again. Another thought in my toolbelt that I use is reminding myself how little time it takes to eat something, a snack, a meal, whatever. About 2 to 20 minutes. Hardly any time at all. Not. Worth. It. Hi, everybody. I'm on Day 10. What I've been posting about in my other group is mental advertising. I was trying to figure out why I could be successful sometimes and totally fail other times. I have been able to complete a 90 day reboot, and another 30 day reboot, but other times I have not been able to stick with it for even 3 days. I realized that at the successful times, the most painful thought in my mind was continuing to be overweight. At the times that I failed, the most painful thought in my mind was not my health or weight, but the feeling of being deprived on the reboot or wanting comfort food to fix a more immediate pain, like stress at work. I mean, the stressful day of work is so much more present in your mind then the pain of still being overweight 12 months from now, or developing diabetes 5 years from now. Our brains are hard-wired to focus on right now, so I try to remember the concept of mental advertising, which is broadcasting to your own mind repeatedly like a commercial on TV, the pain that will result from your action and the pleasure that will result from your action. We're all doing this already, but probably without any awareness of the commercial or oversight of the information. Instead of running the commercial of how much pain there will be if I don't eat the pizza right now, and how much pleasure there will be if I do eat it, I replace that commercial with how much pain there will be if I don't lose the weight and how much pleasure there will be if I do. And I get very specific with the commercial sometimes, like exactly what this person's face would look like if they saw how much weight I had gained and how that will make me feel, i.e. BIG PAIN. Or, exactly the outfit I would wear once I have lost the weight, i.e. BIG PLEASURE. Choosing something in the future over something in the present takes a lot of grit, but there are tools I am trying to incorporate to get my brain to cooperate with my best intentions. "...it will take time, motivation and keeping on track and not giving in to my poor choices of eating, being a slug etc! I do not exercise so I hope the day will come I will feel like doing that, not sure what it will take to get me there? Do you exercise, what makes you want to do it?" I have had a lifelong struggle with exercise. As a child, I played out in the yards with siblings and friends, and we all were very active in those days (despite my being already overweight). No one called it exercise. It was just all fun, it was the way we played. (No electronics, very little tv baby-sitting in those days.) Touch football, softball, red rover, all sorts of active games outside that burned a lot of calories, I'm sure. No negative connotations there. Bear with me please -- I've been trying to put together the puzzle about exercise, so looked at the past. For me, the hatred began with forced exercise in about the 6th grade (there was a new move to force exercise instead of let children out for recess and play, and a "Presidential Fitness" movement)... moving then into "gym / Phys Ed" classes, whre I was teased by horrible children and bullied by the PE teachers. There was no way I could succeed in competition with the athletic kids. While there were segments of PE I did like thru those years, like a few of the dancing segments and volleyball, the mostly negative connotations stuck. We were punished with exercise, held to unreasonable standards, judged and belittled and bullied. I am not the only one who learned to hate PE class. Moving on thru adulthood, even though there was a period where I was very happy to swim every day for myself, I would lose that as I descended into the morass of overweight. Then, each time I have been truly "rebooting" (three major times including this), and have known that I needed to move it or lose it (my physical being), I've seen the same pattern. I start out dreading and hating what I know I have to do. I have to SHOW UP for exercise... in babysteps... and eventually it takes hold and I feel a bit more able and successful at it, and even more eventually, I get to actually LIKE IT. I kid you not. This is just me but maybe something will help you. NOTE: You can stop here. Follows examples of those reboots. Maybe you'll see a pattern, like I do. My first "reboot" -- not anything associated with juicing or actually with what I know now is healthy nutrition, but it was still a reboot, and I was about 33 yrs old? I knew I needed to get back to the lap swimming, when I felt happy and competent about that form of exercising. After some months I managed to start taking myself, my gym bag, and my lunch to the city pool, and sitting under a tree. Then, I'd go home. Time passed and I'd sit in the lane of the pool, not swim, and go home. I remember the day came when I not only swam but enjoyed it without thinking and wanted to do it. Next reboot, probably 20 yrs along the way after we turned plant-based. (I'd learned a lot about nutrition by then.) I had found some walking boots (broken ankle) and started making myself move, with walking longer and longer distances. Eventually it became something I liked to do. Seriously. Last Spring, after starting this reboot, I started with exploring various ways to build in exercise. Against heavy internal programming, I first tried out first a yoga class at the local senior center, then actually signed up for their gym, hoping they would not reject me as too unfit to exercise even there. (Had to get a nurse to sign off but turned out it was only a formality.) But it was a struggle to take the days out to go down there, losing hours/day in travel for me, and I could not see myself maintaining that long term. I didn't want to just walk my neighborhood alone... I'm saying for me, trial and error and finding what works for me. So the thing that finally sort of took HOLD was promising myself I would bike (on my inside recumbent bike) at least 5 minutes per day. Twice per day for 10 minutes if I could make myself. I didn't make it every day by any means. But I told myself "better than I was doing before!" Next, a friend and I put together that we are SOCIAL exercisers. She had started tiny walks at home, and would call me and I would do a bit here on my bike while talking to her. She went out of town to care for elderly parents, and needed the stress relief of calling a friend and spouting off about the situation every morning, so we made an appointment to "walk/bike and talk" over the phone. (I'd tried meeting more than one friend at the walking track but we all walk at diff speeds and were incompatible, and I slow my husband down.) But thru this, I found her coined term, "social exercising," is a major key to my puzzle of me liking to exercise. Some days she wouldn't be able to "meet" me and I was faced with silence. So I found my brother to talk to, who is on the road a lot. When he couldn't, eventually I tried and learned to listen to music or youtube while biking. Finding something intriguing or very laugh-out loud amusing or having company on the phone so it distracts me started reprogramming my subconscious to actually LIKE and look forward to my biking time daily. Because I can do things I wouldn't otherwise have time for... this all took awhile. But over the Summer, I have gone from struggling and putting off 5 minutes / day to eagerly doing 10 miles/day and looking forward to it. SHOW UP. Try and keep trying. Figure out your own puzzle. That's what worked for me. Hope this helps! Good job, Kelly. I'm on Day 7. I've done a couple reboots before. I just posted in another group what I've been saying to myself: "Everything's ok, it takes time, time will pass. I'll get there, I'm on the way." Know your WHY (why are you doing this), that will get you through any HOW. I got that from an exercise video - heheh. So it's the close of day 1. I had 20 oz of the citrus green and the kale, avocado, basil honey garlic dressing. No exercise today, but I am going to bed early enough to get 7 hours of sleep in. Today was a success. 89 more days to go.